In terms of traditional martial arts, Taekwondo is one of the most systematic and scientific. This Korean discipline teaches more than just physical fighting skills, yet is a particularly aggressive form of martial arts. 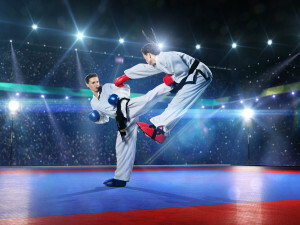 Taekwondo utilizes punches, jabs, chops, blocking and choking moves, and especially powerful, leaping kicks. Taekwondo will enhance your spirit and life by training your body and mind to work together. Today, Taekwondo is a global sport with international competition and is one of the official Olympic games. However, it is also very similar to Muay Thai in a lot of ways. Some might wonder if the benefits of Taekwondo, like Muay Thai, are worth all the effort that you have to put in. Our expert instructors will ensure that the benefits far outweigh any reasons you may have as to why you should not give a free class at our gym a try. Although we do not offer traditional Taekwondo classes in Raleigh, we do offer Muay Thai, Kickboxing, and other forms of martial arts to increase your fitness levels and overall well being. Training at Gracie will also build your self esteem, and give your self confidence a really big boost. The exercises that practitioners of Muay Thai and Kickboxing perform, like Taekwondo, build up a person's core strength which is really important for good health at any age. These muscles support your head, back, shoulders and pelvis. When your core muscles are strong, your posture improves greatly; meaning you will sit and stand tall and upright. Strong core muscles also help a person prevent back problems from occurring because the spinal support system stays strong. Can Your Child Benefit from Martial Arts? Yes, martial arts for kids can really benefit your child. Our junior programs offer positive activities with lessons your child will learn that will stay with them for life. Not only will their physical fitness greatly improve, but their moral development and maturity will significantly benefit as well. Your child will begin by practicing the fundamental skills of either Jiu Jitsu or Muay Thai. These basic patterns and forms include include all the fundamentals of both disciplines including kicking, blocking, striking and punching, and even submissions. These exercises will increase your child's physical coordination, flexibility, balance and strength. Not only will your child's athletic abilities and self-awareness improve, but their capability to defend themselves from bullies will too. The self-defense aspect of learning Taekwondo is immeasurable. Our martial classes in Raleigh for kids can help your child learn the skills that can help prevent them from becoming a victim. Your child will also benefit morally. Kids who practice martial arts learn a great deal about respecting others and respecting themselves. They will learn how heightened concentration, increased self-discipline, and incredible self-restraint can benefit them throughout their entire lives. Oftentimes, you'll observe an improvement in your child's behavior at home, they will be more respectful and willing to help out around the house. You'll also see an improvement in your child's grades as they learn how to really focus on achieving bigger and better goals. Moving up through the ranks is hard work but the payoffs with your child's self-respect levels are priceless. They will learn, at a young age, the necessary skills and mindset to resist and deal with peer pressure. Your children will greatly benefit from Gracie's martial arts classes for kids by helping their lives grow in a harmonious manner through unique movements and activities. For many, martial arts is a way of life that brings positive rewards all through life, and it can be for your child too. At Gracie Raleigh we offer free classes so you can try before you buy, and there are no contracts for children. Please give us a call today to learn more.